IMPORTANT: DO NOT use lighter fluid when starting your charcoal in a Kamado Ceramic grill. Directions: For starting, use an electric starter charcoal lighter, a chimney style charcoal starter using paper as fuel, or firelighters. Check your temperature and start grilling! If you intend to use charcoal lighter fluid with other types of grills, please follow the manufacturer’s directions for use of their product. EASY TO USE: First ever charcoal offered in a box with a top handle, side hand hole, and zip away wedge opening! Our custom blended Hardwood Lump Charcoal will make your Steaks, Chicken, Pizza, Seafood and everything you grill or smoke more delicious. 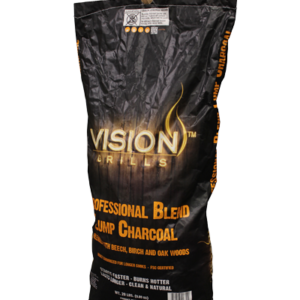 This blended charcoal provides an authentic smoky flavour that barbecue lovers desire. You will find the charcoal is fast lighting, has consistent heat and provides longer burn times, while producing less ash. Ideal for grills and smokers, it brings real hardwood flavour to whatever you cook or grill! Our Lump Charcoal is highly carbonized, this carbonization is created by cooking wood in a low oxygen environment, a process that can take days and burns off volatile compounds. The burning takes place in large concrete or steel silos with very little oxygen. In short, our Premium Lump Charcoal starts fast, burns long, and produces little ash while at the same time provides you with that smoky, flavourful taste that you seek in your barbecued foods.